On the morning of Saturday, April 12, the third day of the fifth annual Turner Classic Movies Film Festival, Bruce Goldstein stood before a thousand people assembled in the Egyptian Theater. In 1997, Goldstein founded Rialto Pictures, a company dedicated to preserving, restoring, and distributing older films. This year, Rialto is bringing the original Japanese Godzilla to theaters in celebration of the 60th anniversary of its release. 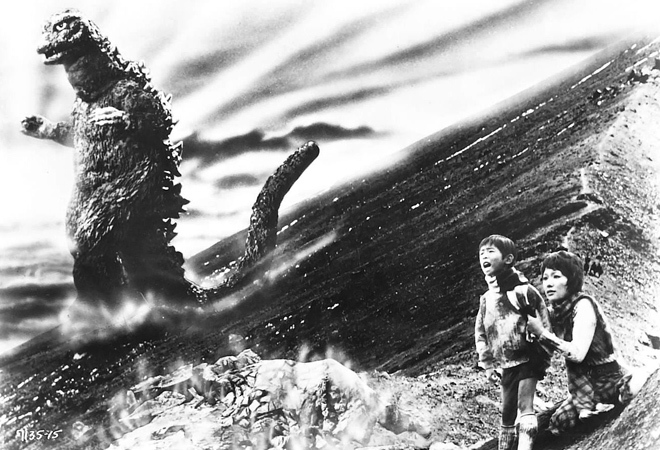 It’s this brand-new restoration that’s playing at the Egyptian, and Goldstein was there both to introduce the film and edify theatergoers about the history of Godzilla. He could not have a more receptive audience. If you think your love of cinema burns more intensely than anyone else’s, you should drop by the TCMFF for a day and measure yourself against the average guest there. These are the kind of people who ensure that On Approval, a 1944 British comedy which few have heard of, sells out not one but two showings. These are the people who break out in raucous applause not just at the sight of a famed actor’s name in the credits but at the mention of that actor during the introduction to the screening. They’ll clap vigorously again as each face makes its first appearance in the movie. They’ll clap for the moments of triumph, laugh at the comedy, gasp at the twists and turns. We can’t help but think it’s like watching early movie audiences react to the first films. That atmosphere alone is reason enough to attend this festival. There are other reasons, too. Chief among them is the chance to see the classics as they were meant to be seen, on a big screen. Rialto’s print of the 1954 Godzilla is stunning, the visuals clear as a bell, free of scratches and dirt. It looks like it was filmed yesterday, even with the now-quaint special effects. Though those effects are dated, they still work like gangbusters. Godzilla (who also earns applause from the audience as he first pops into view) is a living, breathing, utterly convincing character. It’s the immersive enormity of the theater experience at work. The same goes for all the other new prints that premiered at the fest. The new 4K restoration of Double Indemnity was flawless. How Green Was My Valley (which is more than just the film that beat Citizen Kane at the Oscars) has a majestic sweep that wouldn’t come across nearly as well on a television screen. A Hard Day’s Night makes the young Beatles live and breathe (and sing) again. The “youngest” film to play the fest is Mr. Holland’s Opus, which came out only 19 years ago; it was on the program at the behest of its star, Richard Dreyfuss, whose work was honored as part of the weekend’s many festivities. Just two films represent the 1980s. More come from the ‘70s and ‘60s, but it’s flicks from the ‘30s, ‘40s, and ‘50s that dominate the lineup.Of all the well-known basic cable channels, TCM is the only one that has stuck to its original mission. You won’t see them try to pass off some movie that’s less than ten years old as a “classic.” The festival reflects that attitude, and the fans appreciate it. And those fans! We never would’ve imagined that we’d see people wail in joy at the sight of Robert Osborne the way tweens do for a Disney Channel pop star. When Maureen O’Hara, 93 but still lively, came on stage to introduce How Green Was My Valley, one woman yelled, “We love you!” These are the folks who cheer at Takashi Shimura’s appearance in Godzilla but maintain a chilly silence when Bruce Goldstein mentions the impending American remake of the film. It is a decidedly sentimental crowd. When the modern version of the Universal logo played at the start of Double Indemnity, the man next to me loudly tut-tutted, like a stern grandpa disapproving of his granddaughter’s choice of dress. It’s not hard to understand fans’ distrust of remakes and studios that meddle with the classics. After Godzilla Goldstein played excerpts from the film’s 1956 American release, for which a half hour of footage was cut and more was added with American actor Raymond Burr. In this new cut, titled Godzilla: King of Monsters, the Japanese cast is awkwardly shuffled around to make them second fiddle to Burr’s character, who does little besides make unintentionally hilarious commentary on the title monster’s rampage. This is the version that many audiences knew for decades, completely ignorant to the dark gravitas of the original, a horrifying commentary on nuclear warfare. When Goldstein cracked that “We all know how much we hate remakes!” it was like hearing a revival preacher instigate a call-and-response. And yet, when Gareth Edwards, the director of the new Godzilla, came onstage to talk about his love for the original and how it shaped his approach to his version, a bridge was built between new and longtime fans. By the end, he had the audience on his side, cheering as he cheekily reminded them of the new Godzilla’s imminent release date. Good cinema is made with a solid knowledge of what has come before. There’s no better place to see that than at a film festival with like-minded fans–and TCMFF is the gold standard.